Medical Conditions - The Eye Center Inc.
Anterior blepharitis, affecting the outside front of the eyelid where eyelashes are attached. Posterior blepharitis, linked to dysfunction of meibomian glands within the eyelids that secrete oils to help lubricate the eye. It’s common to have a mixture of both anterior and posterior forms of blepharitis at the same time, but in different degrees of severity. Although eye doctors commonly diagnose blepharitis, it can be difficult to find permanent relief of the symptoms that can include burning, flaking, crusting, tearing, irritation, itching, redness in eyelid margins and a foreign body sensation. A complete blepharitis cure may not exist. But good eyelid hygiene and prescription medicine are often effective in managing blepharitis, while warm compresses and lid massages can help unclog obstructed meibomian glands. 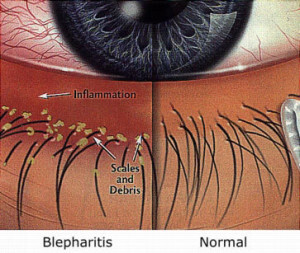 For more information, AllAboutVision.Com has a very informative article concerning blepharitis. Cataracts, which are cloudy lenses in the eye, are the most common cause of reversible blindness in the world today. In the early stages, blurred vision caused by cataracts may sometimes be treated by glasses. However, when the cataract becomes severe, only surgery can restore vision. Ready to see more clearly and say “Goodbye” to cataracts? Request an appointment to learn more. 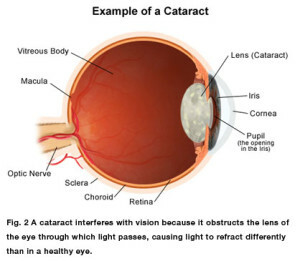 For more information, AllAboutVision.Com has a very informative article concerning cataracts. Chalazion is a benign, painless bump or nodule inside the upper or lower eyelid. Chalazia (plural for chalazion) result from healed internal styes that no longer are infectious. These cyst-like nodules form around an oil gland (meibomian) within the eyelid, resulting in red, swollen eyelids. The contents of a chalazion include pus and blocked fatty secretions (lipids) that normally help lubricate the eye but can no longer drain out. A chalazion results when pus and fatty secretions are blocked and cannot drain. Many chalazia drain, resolving on their own, especially if you facilitate the process with periodic warm compresses and gentle massage of the eyelid. However, some chalazia persist for more than several weeks and grow large enough to become cosmetically unappealing. A larger chalazion may press on the cornea, temporarily creating irregularity on the eye surface and inducing astigmatism. This can cause blurry vision. For more information, AllAboutVision.Com has a very informative article on chalazions. Conjunctivitis, also called “pink eye,” is a common, highly contagious eye infection that often is spread among children in day care centers, classrooms and similar environments. Teachers and day care workers also are at increased risk of pink eye when they work in close quarters with young children. Common infectious conjunctivitis types often have viral or bacterial origins. Infants also can acquire conjunctival eye infections (gonococcal and chlamydial conjunctivitis) during birth when a mother has a sexually transmitted disease. 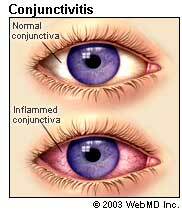 For more information, AllAboutVision.Com has a very informative article concerning conjunctivitis (pink eye). 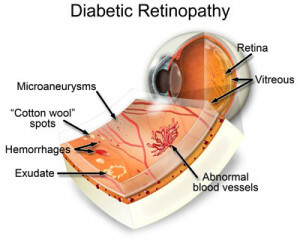 Diabetes damages the small blood vessels throughout the body, including those within the retina, causing them to leak blood, resulting in swelling and vision loss. This is called Diabetic Retinopathy. Treatment may consist of the use of a thermal laser, sometimes in combination with injection of medicine into the eye. Worried your diabetes may be damaging your vision? Request an appointment with one of our skilled doctors for a diagnosis. Another symptom of dry eyes is a “foreign body sensation,” which is a feeling that something is in your eye. And it may seem odd, but dry eye syndrome also can cause watery eyes. This is because dryness on the eye’s surface sometimes will overstimulate production of the watery component of your tears as a protective mechanism. Glaucoma, a disease of the optic nerve of the eye, is one of the leading causes of blindness in the U.S., especially in the older population. This is largely due to the fact that most individuals with glaucoma experience no noticeable symptoms. However, loss of sight from glaucoma can be prevented if detected early enough and treated appropriately. There are two different types of glaucoma. The first, Chronic Open-Angle Glaucoma, is the most common type and is a result of aging. 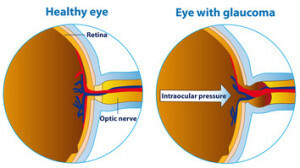 This type of glaucoma is caused when the angle, the part of the eye where intraocular fluid gradually drains out into the blood stream, is open yet the pressure in the eye is elevated and causing nerve damage. Only a small percentage of people ever develop the second type, Angle-Closure Glaucoma. This type occurs when the drainage angle of the eye becomes completely blocked, sometimes causing intraocular pressure to build up rapidly, developing into Acute Angle-Closure Glaucoma. Symptoms of this disease include blurred vision, severe eye pain, headache, rainbow haloes around lights, nausea and vomiting. Although rare, Acute Angle-Closure Glaucoma is serious. If you experience any of these symptoms, you should contact us immediately as failure to receive treatment may result in blindness. Treatment for glaucoma typically includes medicated eye drops that help to decrease eye pressure by either slowing production of aqueous fluid in the eye or improving the flow of aqueous fluid as it leaves the drainage angle. It might also include laser surgery to enlarge the drainage angle and thus lower eye pressure, or create a hole in the iris to improve flow of aqueous fluid. Concerned about glaucoma? Request an appointment for screening as part of a routine eye exam. A Retinal Detachment is a serious and sight-threatening event, occurring when the retina becomes separated from its underlying supportive tissue. The retina cannot function when these layers are detached. And unless the retina is reattached soon, permanent vision loss may result. About one in seven people with sudden onset of flashes and floaters will have a retinal tear or detachment, according to a study reported in late 2009 in the Journal of the American Medical Association. Up to 50 percent of people who experience a retinal tear will have a subsequent detachment. No pain is associated with retinal detachment. If you experience any of the signs, consult your eye doctor right away. Immediate treatment increases your odds of regaining lost vision.